The data center landscape is changing, with IT organizations facing the emergence of the software-defined data center. Over the past few years, the SDDC market has been on a steady upward climb, and this momentum isn't projected to slow down anytime soon. "These days, the market for SDDC is rife with competition, a fact starkly illustrated by the battle between VMware and Nutanix." These days, the market for SDDC is rife with competition, a fact perhaps most starkly illustrated by the public battle between VMware, which has been active on the software scene since 1998, and Nutanix, a virtualization startup founded in 2009. For its part, Nutanix has been working hard to unseat VMware as a leader in the realm of hyper-converged solutions. This competition reached a peak in March, when Nutanix was among the companies to submit bid protests against the U.S. Department of Defense's $1.6 billion licensing agreement with VMware. The agreement would have seen VMware play a central role in helping the DOD to pursue cloud hosting for unclassified data. But following the protests by Nutanix and other companies, the DOD canceled the contract with VMware. In recent months, VMware and Nutanix leaders have come out swinging against each other. In a March 25 blog post entitled "Ten Reasons Why VMware is leading the Hyperconverged Industry," for instance, VMware's Chief Strategist Chuck Hollis responded directly to a competing post arguing for Nutanix being at the front of the industry. "There are over a half-million IT shops who have built their data center strategy around VMware and vSphere," Hollis stated. "Every one of them already owns many of the key ingredients needed for a hyperconverged solution. More importantly, they trust VMware to take them forward into the brave new world of IT." Hollis's post stands on its own as a notable entry in the ongoing spat between two industry players, but it also points more broadly to the increasingly central position of the SDDC market among enterprises. Simply put, data centers are evolving, and vendors are scrambling not only to keep pace, but to assert supremacy in a burgeoning market for SDDC. According to a MarketsandMarkets report on the SDDC market, the sector is set to grow from its current $21.78 billion value to $77.18 billion by 2020, charting a compound annual growth rate of 28.8 percent. This growth isn't limited to North America, either, but instead spans the globe. 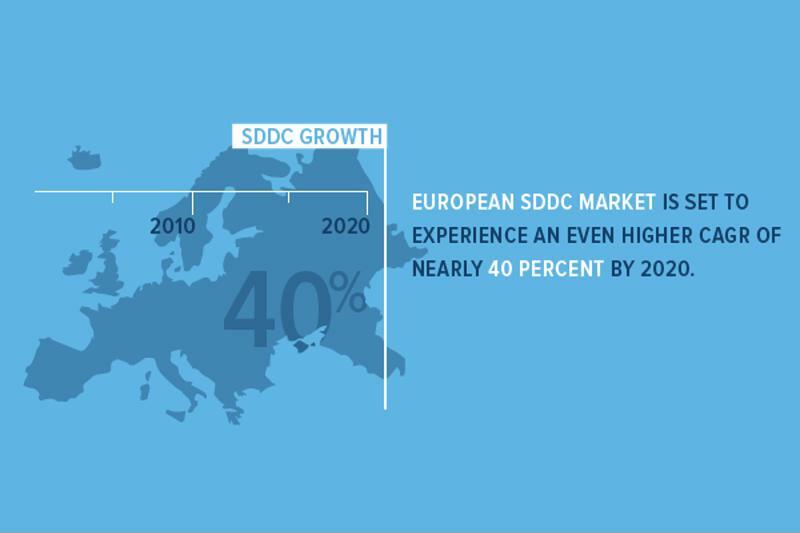 In fact, the European SDDC market is set to experience an even higher CAGR of nearly 40 percent over the same time span. The SDDC market is set to grow at a CAGR of nearly 30 percent over the next five years. "The move to a SDDC represents an evolution that users not only see as business-boosting, but also necessary to keep up with competition." Reduced overhead costs: One of the key incentives for pursuing a SDDC is the reduced overhead costs associated with it, particularly with regard to equipment and the huge potential savings from having as close to 100 percent uptime as possible. However, for these cost savings to happen, legacy data center users need a solution that will allow the scale-up to happen in a cost-efficient manner. Simplified management: Network virtualization offers the potential for significantly increased efficiency of management, thanks to the centralization of management that a cloud-like data center infrastructure model can provide, as InformationWeek has pointed out. And when you have the potential for rapid rollout of applications, you also get a situation where IT is more closely aligned with the general business. General need of IT to move forward: As Dr. Jim Metzler pointed out in a webinar for QualiSystems, less than 50 percent of businesses on the Fortune 500 list in 1995 made it on the 2010 list. What this points to is something IT experts already know: The enterprise sphere evolves quickly, which is a benefit for operations that are willing to keep up and a certain disadvantage for organizations that fall behind with tech deployments. The move to a SDDC, therefore, represents an evolution that users not only see as business-boosting, but also necessary simply to keep up with competition. The traditional, hardware-centric IT model with dedicated appliances and servers can no longer be the solution for users. The need to boost IT team expertise: The move to a SDDC calls for a fundamental shift in IT. As far as IT culture goes, Dr. Metzler pointed out that silos must be broken down in order for IT personnel to all be on the same page, especially as far as grasping automation and orchestration is concerned. A dearth of IT ability in terms of application operation and management has created a hurdle to virtualization, as the EMA paper explained. Without an IT staff and culture that is prepared to leverage the changes SDDC will bring, the move can create a system that is unnecessarily complex and difficult to manage. 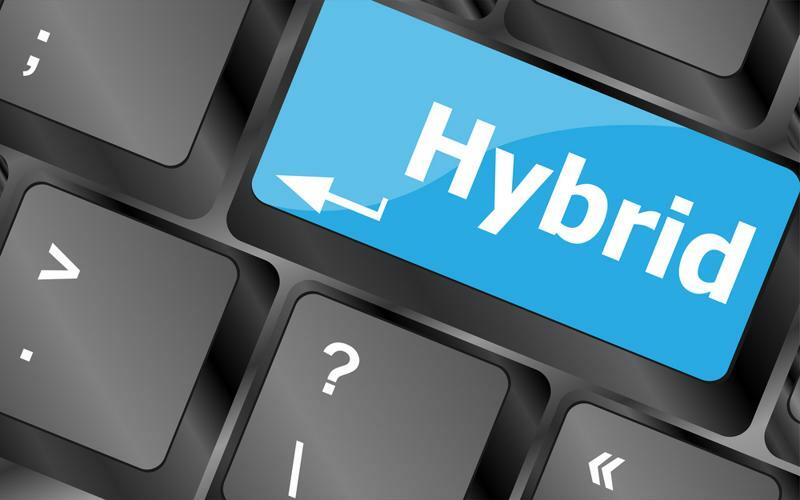 The presence of legacy technologies: As industry expert Aaron Bawcom stated in a piece for InformationWeek, "No intelligent IT leader wants to (or can afford to) rip and replace all systems and vendor relationships in order to adopt SDDC capabilities." But this creates a challenge - namely, how do IT leaders pursue SDDC solutions without doing away with legacy tools? How can the old way and new way be interoperational? Many IT departments need help alleviating roadblocks on the path to SDDC. In the move toward SDDC, enterprises face roadblocks in the form of lack of IT experience and legacy infrastructure, which are incompatible with the future-focused tools inherent driving SDDC. Solutions like QualiSystems' CloudShell are required to bridge the gap between Legacy IT and the next-generation SDDC. As a solution, CloudShell provides operators with the tools and oversight they need to ensure a clear path to SDDC - one that is not encumbered by issues like lack of IT experience and legacy technologies. By offering infrastructure solution providers and IT departments a means of unifying virtualization, cloud, on-prem legacy, and bare-metal infrastructure, CloudShell presents a solution that does not take a fragmented approach. This is vital, since the full ROI from a forward push toward SDDC cannot be realized without all aspects of IT infrastructure being involved. With CloudShell, users get a platform that's ideally suited for the bare metal provisioning process necessary to pave the way to advanced infrastructure. Furthermore, CloudShell's object based workflow orchestration targets non-developer oriented IT and ensures automation best practices that empower legacy IT teams to create sustainable automation around SDDC initiatives. The takeaway: The IT landscape is evolving as the market for SDDC grows. Benefits of the SDDC, like reduced overhead costs and simplified management, face challenges like lack of IT experience and siloed cultures, as well as the presence of legacy IT solutions that would seem to impede progress. In the journey to SDDC, QualiSystems' CloudShell can offer users a tool that eases the shift from legacy to virtual infrastructure and makes the path to SDDC a sustainable one.